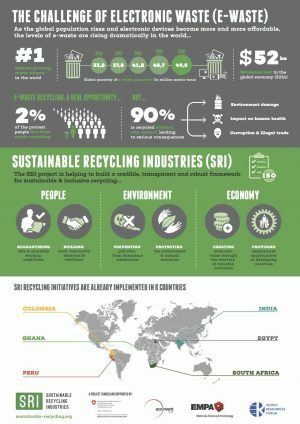 Geneva, 26 October 2017: On the side-lines of their annual conference, the World Resource Forum today presented the key achievements of the Sustainable Recycling Industries project. This initiative, launched in 2012, aims at building a cohesive framework for encouraging e-waste recycling in developing countries. As the global population rises and electronic devices become more and more affordable, levels of electronic waste – or e-waste – are rising dramatically across the world. The United Nations estimates that global e-waste levels will reach 50 million metric tons by 2018. In comparison, in 2002 there were only 24 million metric tons of e-waste produced, making e-waste the fastest growing waste stream worldwide. The extraction of materials and components from e-waste has therefore become a profitable business, in particular in developing countries where million tons of electronic waste are shipped annually and where no collection and treatment system is in place. 90% of e-waste worldwide is therefore recycled under uncontrolled conditions, with serious consequences for poorly protected workers and the environment, while fuelling criminal networks and corruption. Very rapidly after its creation, six countries – Colombia, Peru, India, Ghana, Egypt and South Africa – joined the initiative, including experts and partners from the industry, governments, and the civil society making SRI, still at this moment in time, the largest and longest global cooperation programme in this field. 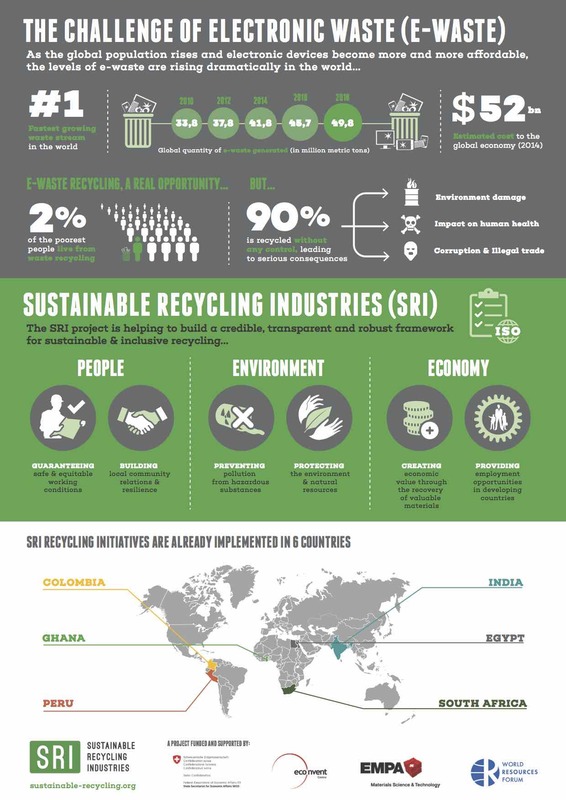 At today’s conference, SRI presented some of the success stories in their six partner countries, including Colombia, which was the first country in Latin America to implement a long-term strategy for sustainable e-waste management. Carlos Hernandez from the Colombian Cleaner Production Center testifies: “The implementation of a take-back system for all e-waste produced in Colombia clearly benefitted our country: it not only created 500 direct jobs and generated 2 million dollars in investment, but it also protects the environment from the pollution and contamination of hazardous substances caused by uncontrolled disposal and recycling”. The SRI project should rapidly expand to involve new countries in Latin America and in Africa. “The problem we are facing today is still huge and grows every day; we hope we can further contribute to encouraging a circular economy and foster capacity for more sustainable practices in developing countries”, concluded Mathias Schluep. Would you like to stay informed on SRI's activities? Would your organisation like to participate in the SRI Roundtable? © Copyright 2017 Sustainable Recycling Industries.